Ribbon Cutting Ceremony at Opening of New C2 Education Center in Marlboro, NJ. “We are so excited to be a part of the Marlboro community and for the positive reception we have received here, Local area residents now have a great new resource to help their kids go on to their dream colleges.” said Center Director Suzette Allan. 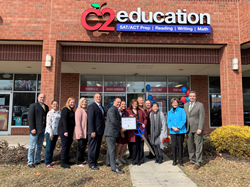 C2 Education (C2), the nation’s premier network of subject tutoring, SAT®, ACT® and PSAT® test prep and college admissions counseling centers recently held a Ribbon Cutting Ceremony and a Grand Opening Celebration to help usher in C2’s newest location at 67 U.S. 9, Morganville. The official ribbon cutting was hosted by the Monmouth Regional Chamber of Commerce and included Free SAT and ACT Practice Tests as well as an open house and an “Understanding Your Score” workshop. Nationally, C2 has a proven track record of helping students gain acceptance into the country’s top colleges. C2’s 2018 graduates reported over 4,400 college acceptances with more than $30 million in scholarship offers. This includes 2,500 acceptances to the Top 100 National Universities, per U.S. News & World Report’s Best College Rankings, with over $15 million in scholarship offers. In addition to the economic and educational impact that the new establishment will bring there is the C2 Community Giveback Program which is an extension of one of the company’s core values of being a proactive member within the communities they serve. Program elements include a variety of events and offerings such as free Homework Help, workshops, complimentary college planning services via the College Roadmap program, free SAT and ACT practice tests as well as local scholarship opportunities and center anniversary celebrations. Families and students interested in learning more about the new location should call 732-851-1730 or visit http://www.c2educate.com/marlboro-morganville-nj . C2 Education (http://www.C2education.com) was founded in 1997 by David Kim and Jim Narangajavana, two Harvard students offering private tutoring programs from their dorm room. Now one of the nation’s leading Tutoring, Test Prep, and College Admissions Counseling organizations, the company has grown to over 180 centers nationwide serving 13,000 students and their families each week. C2 utilizes a unique approach that combines individualized instruction, customized proprietary curriculum, and dedicated education experts to create a personalized experience that enables students to master their specific tests and subjects. C2 Education is headquartered in Johns Creek, Georgia. Follow the company on Facebook at facebook.com/c2educate and Twitter at twitter.com/C2education.